The eyes say it all. The eyes are said to be mirrors of the soul. I wonder why God has made the eyes like a reflection of one's deepest thoughts? Was it because God wanted to give the soul an external image? Indeed how the eyes often give a person away! And there are times when the eyes can hide the feelings too. A newborn baby has no language to voice the feelings. Yet the mother, just by looking at the baby's eyes can understand the baby's feelings. If the baby is hungry, cold, scared or hurt - the eyes give out the discomforts. As a child grows up the mother still looks deep into the eyes to get to the bottom of things. First impressions are said to be the most important. Meeting a new friend or going for a job interview? Surely you will look into the eyes of the new acquaintances. The boss may select you for the job because he or she had seen that invisible link of trust in your eyes. When you meet a stranger the eyes seem to spark off messages. After a good look into the eyes you decide whether you want to get to know the person or not. And indeed there are cases where one can mask the feelings of a cunning person. One might run into a trap because the eyes refuse to give away the real feelings. A deceiver at heart may have cornflower blue eyes that seem to reach your heart. While you stare at the eyes and believe every word that comes out there may be murderous plans behind those lovely eyes. Public speaking is often a complex task for many. There are some who go up to speak to the audience with shaky legs. The audience is like a vast, rough sea that one has to cross. At such times experts suggest that the speaker should make eye contact with those who are sitting in the front rows. In the classroom scenario teachers get better control of their classes when they go to eye contacts with their students. The most restless student is known to sit still under the eyes of the teacher. Love at first sight? How often the eyes hold the mystery of it all! It is said that when the spell occurs the partners look into each other's eyes and get lost into the cupid's world. The longer they look the more they fall in love. Professor Eckhard found that enlarged pupils signal intense arousal. Love at first sight holds firm belief in the world of romantic love. And the eyes are said to do the first trick. When partners look into each other's eyes they see far beyond the eyes, they see into the soul. Using figurative language? The eye of the hurricane can be disastrous to be in. The bull's eye in the other hand is something everyone wants to shoot the arrow on. We have our own eyes to choose the world with. And then, in this world we may not see eye to eye with others. On the other hand if you are naïve you may see the world through someone else's eye. If you have an eye for the smart things you are considered to be a worldly person. And there are times when a politician can go up and down in the public eye. Eyes; black, blue, brown or green, all eyes hold so much weight behind them. Take care, don't be fooled by innocent looking eyes. They may be ready to pierce your heart. And on the other hand don't miss the cupid's message written in your love's eyes! The eyes say it all. In some Gulf states staring at a man is considered flirtations. Tourists are advised to avoid too much eye contact. Dark glasses can reduce embarrassment, but be sure to take them off when you speak to people directly. 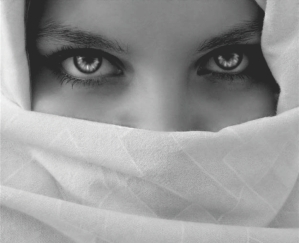 In many cultures hiding the eyes can be seen as rude. And so the eyes, as parts of our bodies can do a lot for us beside their function; to help us see. In fact they help us to see beyond what is there in the vision. Take good care of your eyes. After all the eyes have it all.